A Dutch man, Rex (Gene Bervoets), and his girlfriend, Saskia (Johanna ter Steege), are on holiday in France. They stop at a gas station for a rest and to refuel, and sitting in his car is a man (Bernard-Pierre Donnadieu) who affixes his arm with an artificial cast and sling. When Saskia enters the station for drinks before the couple hits the road again, she does not return. Rex searches the area and questions the gas station manager and employees, but there is no trace of the woman. Three years later, Rex is consumed by his search for Saskia. Though he has a girlfriend, Lieneke (Gwen Eckhaus), her companionship cannot outweigh his obsession. Rex has received postcards from someone claiming to know what has happened to Saskia, but when he waits at a specified meeting place, there is no one. When Rex finally makes an appearance on television to tell the story of Saskia’s disappearance, Raymond, the man from the gas station years ago, approaches him, saying that he can tell Rex of his girlfriend’s fate. 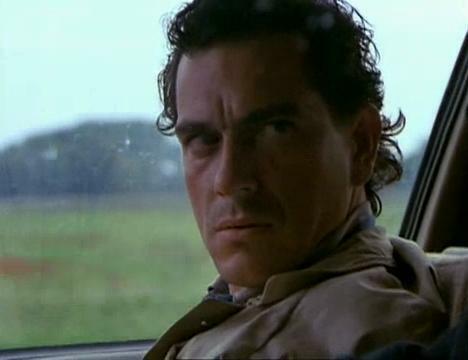 George Sluizer’s 1988 film The Vanishing (aka Spoorloos, the original Dutch title) is an elegantly complex feature, most notably for an early introduction to and subsequent spotlighting of the villain. Following Saskia’s vanishing, the film’s perspective switches to Raymond, a family man and school teacher, as his plan slowly materializes. He is meticulous, each of his acts another step towards his objective. What makes Raymond such an appalling character is the fact that he is thorough, mapping out every aspect and even practicing (at one point involving his daughter in a scenario, unbeknownst to her). Another frightening point is the origin of specific ideas, sometimes coming from someone else, such as his family. Raymond is, as he himself says, a sociopath, cold and detached, and his very nature is chilling. When his wife expresses concern that he may have a mistress, Raymond alleviates her worries not with charm but in a direct, businesslike manner. Much of the film plays like curtains being drawn back, not for a shocking revelation, but rather to unveil the inevitable horror. Sluizer offers clues throughout the course of the film, not truly hiding anything. The ending may not be the preferred destination, but it is the only way. This gives deeper meaning to an early scene, when Rex and Saskia run out of gas in the middle of a dark tunnel. After retrieving gasoline, Rex drives the car out of the tunnel, visualized from his point of view. The meager light at the tunnel’s exit gradually increases, revealing to the audience what it can already see -- and standing in the light is Saskia, who is waiting at the end. The Vanishing was based on the novella, The Golden Egg, by Tim Krabbé, who wrote the screenplay adaptation with Sluizer. The story’s title is referenced in the film by a description of Saskia’s dream, in which she is trapped inside a golden egg, a dream that Rex also experiences during his desperate search. Sluizer, who also produced, and producer Anne Lordon won a Golden Calf for Best Feature Film at the Netherlands Film Festival. The film was the Dutch submission for the Academy Awards’ Best Foreign Language Film category but was ineligible since a great deal of spoken dialogue was in French. Actress ter Steege, in her film debut, won an European Film Award for Best Supporting Actress (the very first year that the European Film Academy held a ceremony). Actor Jeroen Krabbé is author Tim Krabbé’s brother. The actor has appeared in a number of films, perhaps most famously in The Living Daylights (1987) and The Fugitive (1993). He also co-starred with ter Steege in Immortal Beloved (1994). Sluizer directed a Hollywood remake of The Vanishing in 1993, starring Keifer Sutherland, Jeff Bridges, and Nancy Travis. The narrative structure is only slightly altered, with a significant change being additional screen time for the U.S. version of Lieneke (played by Travis). The most drastic revision, however, was the ending, which was compromised to allow for a more upbeat conclusion. The movie was a commercial and critical failure. I remember thinking when I first read Sark's review that I wanted to get this movie to watch. Then I forgot! Glad for the reminder!